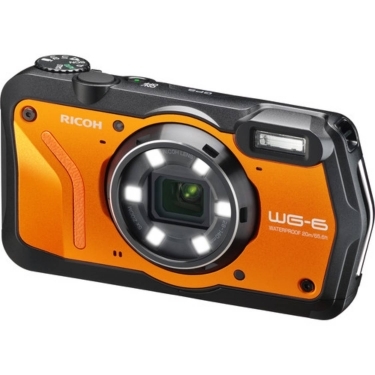 Dubbed an all-weather extreme compact camera, the orange Ricoh WG-6 is distinguished by its impressively rugged physical design, incorporation of useful shooting modes, and versatile imaging capabilities. 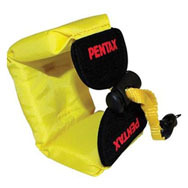 Its durable exterior construction renders it waterproof to depths of 65.6', shockproof from heights of 6.6' as well as freezeproof, crushproof, dustproof, and resistant to chemical disinfection. In regard to imaging capabilities, the WG-6 features a 20MP BSI CMOS sensor, which enables high-resolution stills shooting, a sensitivity range from ISO 125-6400, and UHD 4K30 video recording as well as Movie SR+ and Movie SR stabilization modes to help steady video footage. A 5x optical zoom lens also contributes to this flexibility, and covers a wide-angle to telephoto 28-140mm equivalent focal length range. 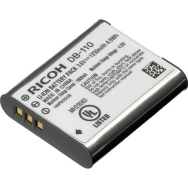 Additionally, the WG-6 incorporates a bright 3.0" 1.04m-dot AR-coated LCD monitor, an LED ring light to benefit photographing close-up subjects, and a high-accuracy GPS module to permit embedding location information within your image files.